Disrespect, Nastiness, Fear and Audiotape: Listen For Yourselves as to How the Abysmal Conduct of D181 Board Members and Administration is an Embarrassment to Us All. It has been almost one week since the April 13, 2015 BOE meeting held at Hinsdale Middle School. It was a marathon meeting, 3 hours 49 minutes long, and even we couldn't listen to the entire meeting on Monday night without throwing in the towel. With tax returns due on Wednesday and the craziness of everyday life, it has taken us until now to listen to the end of the meeting and decide what to focus on in this blog post. We are going to keep this relatively short, because frankly, we are completely disgusted with the antics of the outgoing board and we want to say as little as possible about them, however, we are going to focus on three adjectives that we think describe the behavior of certain board members, but also certain D181 administrators: Nasty, Disrespectful and Afraid. Mr. Turek, Mr. Yaeger and Mr. Nelson: You are nasty and disrespectful board members. Monday night's meeting was the most recent example of the obvious disdain you have for Board Member Garg. Monday night's meeting was also another example of how you have lost touch with the community and have made it your mission to squash like a helpless bug any community member who makes a public comment that you do not personally agree with or that calls out the administration for not being responsive to community concerns. We urge our readers, and these three board members to listen to the meeting tape.You (and they) will all hear the nasty,disrespectful and condescending tone they took with Ms. Garg, whose only crime was to ask respectful questions and attempt to make comments after various motions were brought. Mr. Yaeger in particular told Ms. Garg at one point that she could only vote on a motion by saying YES or NO, completely disregarding her right to discuss or comment on a motion. Thankfully Ms. Garg pushed back and took a stand, refusing to be silenced by Big Bully Yaeger. Towards the end of the meeting when Ms. Garg asked for questions to be added to the annual parent survey -- regarding parents' awareness of the proposed math plan, parent's knowledge of math groups their children have actually been placed in and community members' understanding of integrated classrooms and satisfaction with special education services since D181 withdrew from LADSE (the special education cooperative) -- Ms. Garg was once again shown disrespect, but not just by fellow board members, but also by Dr. White and the district's Communication Director, who essentially stated that there was no point in asking these questions. SAY WHAT? "What would we do with that information?" "We don't agree about asking parents about implementing integrated classrooms." "I don't think it's the right question." "I'm not sure we agree that that's a question that is going to lead us anywhere." "We don't agree about asking parents about implementing integrated classrooms because its, I don't think its the right question." "I don't think we'd support adding those questions." Mr. Turek argued that Ms. Garg was attempting to micromanage the survey, despite Ms. Garg's explanation that the survey is the only opportunity for the full community to weigh in on essential curriculum issues, and that if the survey is going to include questions about when to call a snow day, etc., parents should be afforded an opportunity to provide feedback on curriculum issues. BRAVO Ms. Garg and shame on Mr. Turek, Dr. White and the Communication's Director for attempting to silence her, and for their obvious FEAR of what the community might say in response to the proposed questions. It is pretty sad to realize that the administration and current board president really don't want to hear the truth from the parents and it appears they will only craft a survey that will provide feedback they want to hear, and not ask questions that might result in negative feedback. It is clear to us that the administration is AFRAID to ask meaningful satisfaction questions, just as they have been afraid to produce DATA in response to Board Member Garg, Heneghan and Vorobiev's questions. If this is really Dr. White's attitude towards the community that pays his salary, then sadly, we hope the new board seriously considers if Dr. White and his administration are providing value-added services to our district in exchange for their very generous, taxpayer-funded salaries. If this is questionable, then perhaps Dr. White's contract and those of his administrators should not be completed through their existing terms and at the very least should not be renewed at the end of the contract terms. We, and especially our kids, deserve better than what we are paying for, period. As bad as the nastiness and disrespect exhibited towards Ms. Garg was by Turek, White and our soon to be departed (and we can assure you, quickly forgotten) board members Nelson and Yaeger, what was more offensive to us as parents was the complete disrespect Turek and Yaeger showed towards a community member who made a public comment in which she brought special ed concerns to the BOE's attention. Listen to the parent's comment on the Podcast at Counter 02:02:15. The parent stated that she did not believe the district was in compliance with certain federal and state special education laws and also asked for a question to be added to the parent survey regarding special ed services. She stated that "Our pupil services administrators act as road blocks. They are either incompetent or they flat out lie, it's as simple as that." Mr. Turek immediately tried to shut the parent up by stating: "I can't allow you to call people out as liars without sup..."
When she responded that she hadn't named names and wanted to tell the Board things she had heard had happened that resulted in no action by the central administration, Mr. Yaeger went after the parent trying to shut her down as well saying she'd already raised her concerns with the board. The parent's response was "Then why is nothing being done?" Of course her question wasn't answered and when the parent went on to reference the open special ed position, Mr. Turek told her that "I'm going to have to ask you to stop. We've heard this and we get it." Really Mr. Turek? You get it? Really? Because your inaction speaks louder than your empty words. Turek informed the parent that he was not going to allow the back and forth exchange to continue, which we found laughable since HE started the back and forth exchange, rudely interrupting a parent's freedom of speech right to make a public comment! But then in his overly condescending and pompous manner, Turek went on to say that the parent should schedule ANOTHER meeting with White who Turek said "I'm confident that he will grant you another meeting." Grant her another meeting? Who does Turek think White is? Oh yes, the Emperor....... Good luck to the parent. We really can't believe what we heard during the meeting. It was absolutely outrageous how a board member and community member were treated by Turek, Yaeger, Nelson and White. Completely unacceptable! And to what end? We sincerely hope that the incoming board members will take a lesson from what transpired at Monday's meeting and commit to never treating fellow board members or community members with disdain and disrespect. The outgoing board members need to hit the road, Mr. Turek's reign of terror as board president must end and the new board needs to be seated and move the district forward in a more positive and collaborative way under the leadership of a new board president. We eagerly anticipate the new board members taking the oath of office. Let's remember that these new BOE members were elected to effectively make changes, examine the true state of the district and to right the course that has been wrong for the past several years. The May 4th BOE meeting can't come soon enough. The Department of Learning has been working to update and revise the Learning for All documents/plan for the Board of Education. At the February 9, 2015 Board of Education meeting, a presentation was made on the proposed math programming for the 2015-16 school year. In this presentation, it was recommended that the vast majority of students would work with grade level content based on the implementation of the new Illinois State Learning Standards and the experience of the teachers using the newly adopted math materials. Students would also have access to above grade level content, as needed, through differentiated instruction. While we anticipate the vast majority of students’ needs will be met through grade level curriculum, differentiated instruction in the classroom, and the newly adopted resources, there may be individual students who require subject acceleration. Tonight’s discussion focuses on the process to consider students who may need math subject acceleration to meet their needs. Math subject acceleration will be considered for students who consistently require above grade level math content. Utilizing the RtI process, individual teams will make the decision using a collection of assessment data, teacher/team input, and parent input. Students must demonstrate strengths in all three (3) areas in order to receive math subject acceleration to meet their needs. *This chart reflects a proposed implementation for the 2015-16 school year. Decisions for future implementation will be based on teacher feedback and student data. Impressed? We didn't think so. Disgusted? Heck, yeah. Yes, folks; several of the polarizing-unabashedly-disconnected-huckster-supporting-BOE members are to "discuss" this math "acceleration" plan that actually contains little to no acceleration for our students. Sound familiar? Ahh, yes. Our faint memories now recall that the "Advanced Learning Plan" did not contain a plan for advanced/gifted learners. Remember? The ALP was actually a hidden tribute to what now is known as Learning For All (Some) that many of us would characterize as a colossal failure. And how about this: not too long ago 30-40% of our students were identified and received advanced or accelerated instruction. How will the needs of this population be met with this limited inclusive ideology? Our point is pretty simple: parents should attend this meeting or write to the current and eventually new BOE and make their concerns known. We believe the newly elected BOE members will be in attendance and they should hear parent concerns. And because of the importance of the acceleration issue and Learning for All (Some), we question why this topic is placed as the last agenda item in the Committee of the Whole meeting segment. Gee, is it because the agenda is packed full and the Turek/White agenda-setting tag team figures that many parents will leave the meeting due to the anticipated late hour in which this item will be brought up, if at all? Whoa! We're on to you guys and how you attempt to manipulate and control the agenda items for discussion. Congratulations to the winners: Jennifer Burns, Richard Giltner, Leslie Gray, and yes, even Marty Turek. 1. We are understandably disappointed that John Czerwiec did not win, but we are very grateful that he chose to contest the election and bring a real debate of the issues to our community. Mr. Czerwiec should be proud of the campaign he ran and the unselfish support he showed for Burns, Giltner and Gray. Mr. Czerwiec, you are a CLASS ACT and we hope you consider running in 2 years! 2. It amazes us that in a district with so many educational issues affecting our children, that there was still a very low turnout. The Cook County election commission indicates that only 15.45% of registered voters cast a ballot. We will post the Dupage County percentage as soon as it is published. Complacency is never a good thing. 3. The motto, "Ignorance is bliss" is NOT a good thing, and in our opinion, that is the only reason that Mr. Turek was reelected. He rode in on the coattails of the three other caucus candidates. He won nearly 700 votes less than Ms. Burns, and came in dead last to the three other caucus endorsed candidates. By no means, should he take his "win" as an endorsement of his past behavior and actions on the BOE. 4. We sincerely hope that Mr. Turek realizes that he only won because the Caucus was stupid enough to endorse him and not because he has been a good or effective board member. In our opinion, he simply got lucky. We hope he learns something from this election and begins to work hard to reclaim the trust of the many voters who refused to vote for him. 5. But Mr. Turek has won, and now the D181 community is going to have to accept his "continuity" on the BOE. We sincerely hope that the NEW BOE members will work with Mr. Turek and the other candidates to return academic excellence in the curriculum for ALL students AND accountability, not just in the decisions made by the Administration, but in the decisions made by the BOE. 6. Guess the "vote for only one" candidate strategy didn't work out so well for the other loser..
Planson, Carpenter and Hirsman won! We couldn't be more thrilled. Congratulations to these three candidates who will bring much needed change to that board of education. Well, that's all for tonight! It's been a long day and night and we are signing off. But we invite our readers to SOUND OFF on the election results and what they might mean for D181's future. Yes, it's true. 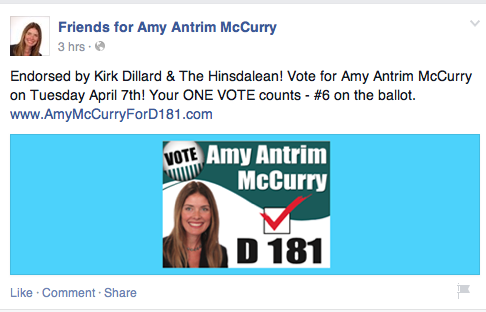 Straight off of McCurry's facebook page that she has created for the D181 election, she is suggesting that everyone either only has ONE vote to cast tomorrow or should ONLY cast ONE vote. Thanks Amy for showing your true colors on the eve of the important election of FOUR D181 Board of Education Members. We are sure there will be a quick scramble by her "friends" to explain away this FaceBook post and argue that it doesn't mean what it says. But we parents in D181 are NOT STUPID or NAIVE. We know that this is exactly what Amy wants -- she wants all voters to only cast one vote, so as not to dilute her votes with those cast for the other voters.This type of campaign tactic, in our opinion, proves she is selfish and only cares about herself. In our opinion, this proves she is not now and will not be a Team Player if elected. 1. Her refusal to publicly address (AS IN HER OPENING OR CLOSING statements made at TWO debates) her CONFLICT of interest. 2. Her convenient, yet "unapproved" resignation. 3. The lack of job vacancy on the D181 website. 4. Her statement to the Hinsdalean that she is looking forward to learning about the tax levy process after her election and yet her revelation on her Facebook page that she has been meeting with Gary Frisch to learn about the district's finances - an interesting (and let us say another example of a conflict) expenditure of taxpayer money since he is salaried and no doubt has been meeting with her while "on the clock." Here is what she says on her Facebook page Q&A: "I have spent multiple hours with our Assistant Superintendent of Business and Operations, Gary Frisch, to gain further insight and knowledge of our finances." Has he offered or given time to the other candidates? Or is an example of an administrative "favor" as a result of her employment status and their obvious desire to have her on the BOE? 5. The convenient absence in the Clarendon Courier of the MANY letters that were submitted to it supporting the other candidates (that were published in all of the other local newspapers), and yet the full column the Courier ran by her husband in which he supports her. 6. The "interesting" representations made by at least one person who has publicly endorsed her about her D181 job that apparently involves designing students' educational plans, something we find shocking if true, since she is not a certified employee of the district nor is she an administrator or teacher. It makes us wonder exactly how Dr. Schneider is running the Special Ed portion of the Department of Learning since we have heard parents make public comments recently criticizing how their children's needs have NOT been properly addressed by D181. It is a real shame that rather than encourage all D181 voters to casts FOUR votes tomorrow -- as all of the other candidates (except for Mr. Turek) have publicly done, either during the debates or their various websites and Facebook pages--she has turned her back on the very people she will have to work collaboratively with IF she is lucky enough to be elected. Our children, taxpayers and PARENTS all deserve Board of Education Members who have made this election about voting for FOUR individuals who will work together. Our children, taxpayers and PARENTS all deserve representatives who have not behaved in a selfish, arrogant manner during the campaign season. On April 7th Vote for the FOUR CANDIDATES with integrity, who by their campaign actions have PROVEN that they are willing to support and work with each other: BURNS, GILTNER, GRAY and CZERWIEC. As a retiring District 181 school board member I would like to thank the D181 community for the oppor- tunity to serve a community that has so many talented students, dedicat- ed parents, hard-working staff and generous community members. It has been my privilege to serve you. to move the district forward. For example, Ms. Gray spearheaded the charge to ensure that large schools (Prospect, Madison and Monroe) received an equitable share of resources and Ms. Burns articulately speaks for the education of all stu- dents. I support Jennifer Burns, John Czerwiec, Richard Giltner and Leslie Gray for D181 Board of Education. They will work with the existing board members and administration to bring our district back to its past level of high academic performance. thing to the table that will make this board a cohesive, well-rounded group that will best represent the stakeholders and tax payers. Collectively, their experience in strategic plan- ning, education, technology, finance, state legislation and tax law enables them to take an analytical eye to the decisions that the BOE is responsible for making. These candidates will make decisions that are fiscally sound and in the best interest of our students. As a parent of a special education child, I am voting for Jennifer Burns, Richard Giltner, Leslie Gray and John Czerwiec for the D181 BOE. The needs of special education children will be met under their watch. This district pulled out of LADSE several years ago under the premise that the needs of our special edu- cation children would be met more effectively in house. There has been no analysis as to whether our children have been better served. In addition, this district does not currently have a dedicated special education director. ISBE guidelines mandate that one employee must be devoted solely to this position. In other words, D181 is in direct violation of ISBE guidelines; this is doing a great disservice to our special education children. most vulnerable members of society. School districts are responsible for actively locating, identifying and eval- uating all children who may qualify to receive special education or related services. Instead, as in the case of my son, D181 staff refused to evaluate him for a learning disability because he has ADHD. Moreover, D181 staff told us that if he has dyslexia, it is a medical diagnosis and not an educa- tional issue. Worse yet, district staff suggested that we hire a tutor for him. Statements like these are a clear vio- lation of state and federal laws, and open the district to liability. have volunteered extensively in their children’s schools and on district committees. Most importantly, they have been vetted and endorsed by the Hinsdale Village Caucus. are objective and independent with no conflicts of interest. They are also fiscally responsible. These attributes will allow them to effectively address the host of curriculum, financial and facility issues facing our district. We are at a crossroads in D181 as data points have dropped while the importance of metrics in changing curriculum has been eliminated altogether. 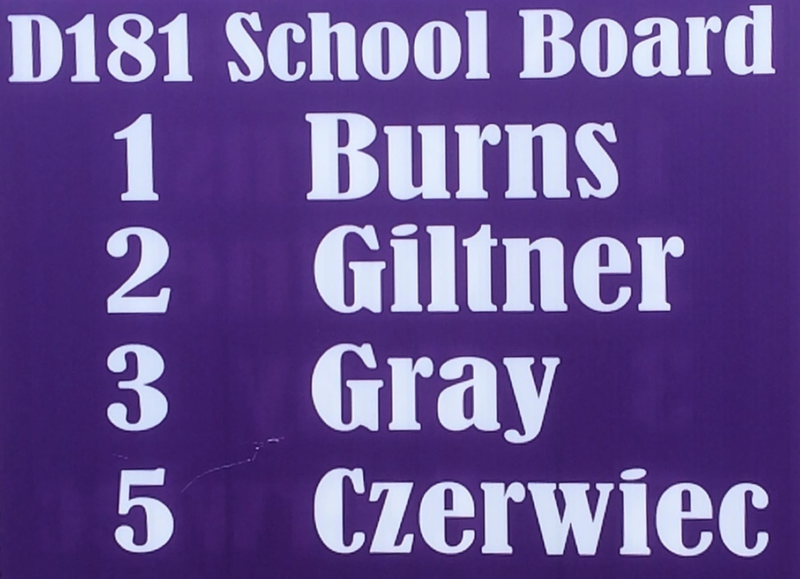 I fully endorse the four best candidates for BOE D181: Burns, Giltner, Gray and Czerwiec. Vote 1,2,3 and 5. After a successful career in corpo- rate America, real estate purchases and a portfolio prior to getting mar- ried and moving to D181, I have been a 24 x 7 full-time mother to two eager learners for over 12 years. extensive financial expertise and Czerwiec offers both municipal and an IT background. I cannot think of a more balanced, objective group to face our critical issues.